This time of year, I feel like I’m being pulled in a million different directions. Between my job in real estate, my nighttime job working on my blog, and writing my column for Cincy Chic, I’m stressed out about 90% of the time. There are times when I’m just so exhausted that I’ll resort to using a makeup wipe to remove my makeup. Anything that will help me get into bed quicker! This really doesn’t do the trick though, and I wake up feeling burdened by remnants of the previous days makeup. 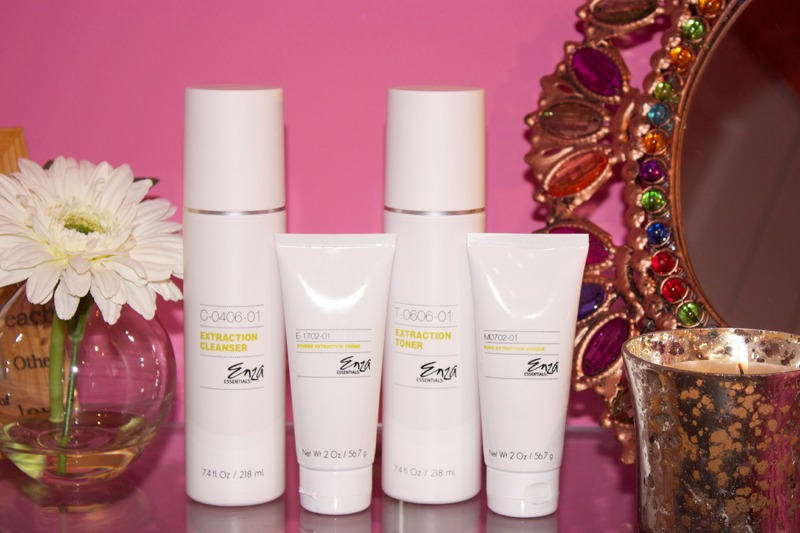 When Enza Essentials contacted me to review some of their products, I was thrilled. Looking around their website made me realize how nice it is to have a product targeted just for your skin type. 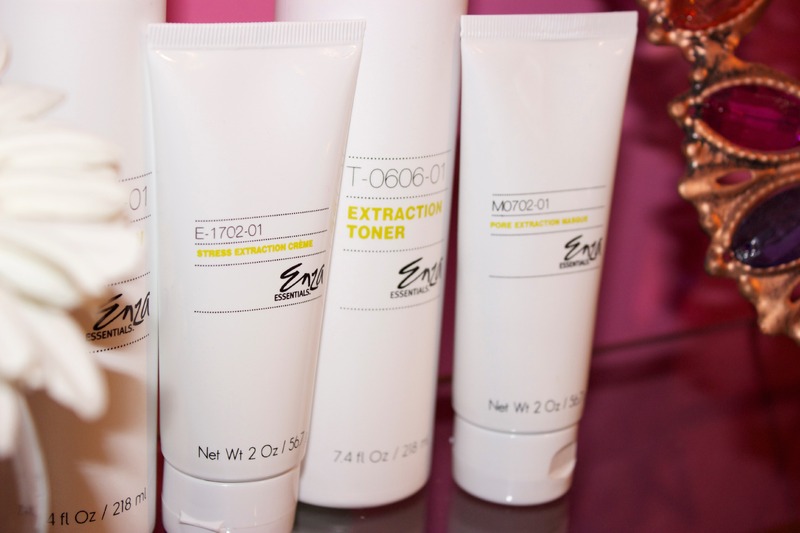 Enza Essentials was developed by plastic surgeon Dr. Joseph Rucker, and the products are based on variables like hormones, ethnicity, and lifestyle. Basically, you get individualized products to combat your biggest skin issues! I’ve never found that with other skincare lines. My biggest skin issues are oily spots and random breakouts from my daily stressors. After telling the Enza team of my skin problems, they sent me the Extraction System. It included the Extraction Cleanser to rid my skin of oily buildup from the day, Extraction Toner to energize my skin with a peppermint scent, the Pore Extraction Masque* to firm my skin and unclog pores, and the Stress Extraction Creme to moisturize my skin without leaving it oily. *The Pore Extraction Masque was amazing! I felt my skin instantly tighten after applying it. Like, I couldn’t even smile until I washed it off. Talk about feeling a product working! I was very impressed with how easy and effective these products were, especially for someone who tends to be lazy by the end of a stressful day. 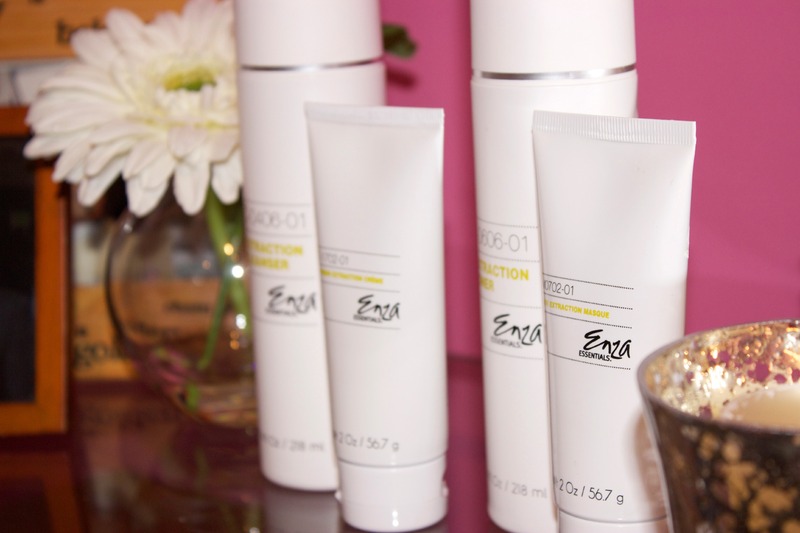 I highly recommend checking out Enza’s skincare products. They have a solution for everyone, and it makes you realize that there is a personalized solution just for you! What is your skincare routine? I’d love to know! PS- thank you SO MUCH for all the amazing comments on my First Blogging Birthday post! It truly made my day/weekend reading all of them. It reaffirmed my comments in that post that blogging has been nothing but positive and introduced me to some awesome people! We are so happy our products work for you! Thanks for sharing your story. p.s. I LOVE the pore extractions masque too! My skincare routine is pretty boring – I use coconut oil or olive oil to remove my eye makeup and then I use a tea tree oil soap to wash my face. After that, I moisturize. Once in a while, if I feel like I’m breaking out a bit too much, I use a honey/lemon mask. I’m not sure which of these did the trick, but once I started this routine, my breakouts greatly decreased (before that, I tried everything and was getting super frustrated). It amazes me how different each of our skin is – what works for one won’t work for another and vice versa. So good to know about the honey/lemon mask! I used to put lemon juice on my breakouts, but I feel like it only made my skin dry. Definitely need to try out that mask trick! My mom uses coconut oil and seriously loves it. She says her skin is so soft and has a glow to it. Thanks for sharing Grace! Addicted to Enza’s Pore Extraction Mask!!!!! Using it 3 x week has cleared up my midday shine! Me too!! I love that it instantly tightened my face. It worked instantly! Thanks Kristine! Great review doll. I love hearing about new products/lines I haven’t been exposed to yet. Thanks Ashley! I use Clinique and Olay products as well, and love them! Do you like your Clarisonic brush? I’ve been wanting one for so long and love hearing if people think they’re worth it! Thanks Cara! I totally feel you. It’s so hard to find something that’s a complete miracle worker! I’m always looking for great skin care too! I suffer from the same occasional breakouts, usually due to stress, I can’t wait to check the products out! Thanks Jen! Breakouts are the WORST. I don’t know about you, but mine always come just in time for the weekend! It’s so great! You should check out their products, they seriously have something for everyone!